LATEST! – Martin Sheen goes public with his doubts about the official 9/11 story; Robert Baer (20 year CIA veteran and successful US fiction writer) states the evidence points to 9/11 being an “inside job”. See News & Events. This site is dedicated to the victims of 9/11, their families, our troops, and the subsequent hundreds of thousands of innocent civilian victims of the wars in both Afghanistan and Iraq. 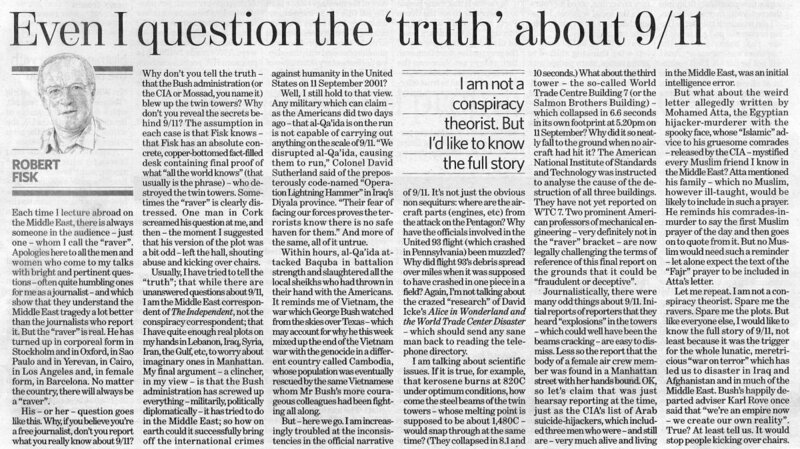 Please click on the image (left) to read Robert Fisk’s article Even I question the ‘truth’ about 9/11, published in the British newspaper The Independent, 25 Aug 2007. The following trailer (only 3 mins) is for a film by four women whose husbands died in the World Trade Centre towers that day. It is available in full under the 9/11 heading at the top of this site. All of the following clips are a maximum of three minutes long. Please watch them all if you have the time. “They lied, they all lied.” – Patty Casazza, 9/11 widow who appears in this film. Having problems viewing this video? Click here. – Danny Jowenko, Demolitions expert interviewed on Dutch television. Here is a 3 minute re-cap of the collapse of World Trade Centre tower 7. This building had not been hit by any planes and had some small fires. This is a short film, again only a few minutes, about trusting what you see, not what you are told. It is called This Is An Orange. You will find here numerous documentaries and footage that will inform you about the 9/11 issue. There are over 30 films and some 20-30 hours of footage in all. At the top of this page you will see seven different headings (please note: some of these pages may take a short while to load owing to their media-heavy content), and down the right hand column four sections and a search facility. 1/ FRONT PAGE – That’s here. See the links under RECENT POSTS (to the right) for the information you can see here. 2/ 911 – Films about the 911 WTC attacks and the copious anomalies in the official report/story. 3/ ACTION – Find out what to do. 4/ MEDIA – Films/footage/documentaries concerning the corporate media and journalistic corruption. 5/ NEWS & EVENTS – Latest news and events information. 6/ RELATED – Related films and miscellaneous footage. Please do not disregard this section. There is some fascinating and important material here. 1/ RECENT POSTS – The links in this section should be fairly self-explanatory. 2/ ANNOUNCEMENT – Here we will often have an announcement about an upcoming event or a picture of our current leaflet that we are handing out to the public from our stall in Oxford city centre. 4/ BLOGROLL – Here are a number of reputable external sites. Please visit these sites as some of them provided us all with vital insights into the truth behind the 911 tradgedy. Many of them are constantly updated with breaking news and views. Many of them are supported by academic and professional institutions: they are the big guns of the 9/11 truth movement. We at Oxford 911 Truth hope this information will assist you in your search for truth. We hope that you will join our campaign. Please pass this resource address onto all of your family and friends. Complain to your local media and constituent MP’s. To email your MP go to www.theyworkforyou.com, and be clear, brief, and polite. Raise awareness of this issue but do not antagonise anyone as it is detrimental to our cause. Please ask any questions in the comments and we will try and answer you. Please be aware, however, we have jobs too! Should you wish to contact us, email oxford911truth@gmail.com. Alternatively, come and meet us at our stall 12-2pm, Oxford Cornmarket Street, every Saturday. 1/ Any theory that planes did not hit the Twin Towers. There is sufficient media footage and eye witness account to disregard such an idea. 2/ That George W. Bush “did it”. We frequently have people approach us who feel that this is what we believe. We are not sure who perpetrated the attacks. 3/ Conspiracy theories. We are not theorising. We are not privvy to enough information – withheld by the US government – to speculate. All of our information comes from professional, reputable, and official sources. Our only concern is to highlight the copious and glaring inconsistencies in the official story. We believe these, alone, justify a new and independent investigation. We are aware of a vast body of evidence that proves the true circumstances behind the 9/11 World Trade Centre terrorist attacks are being covered-up. We hope our leaflets and this website will go someway to introducing you to these facts and assist you in making an informed decision about what happened that fateful day. Owing to the amount of information regarding this tragic event that has been made unavailable, we can only speculate about the truth. Our purpose, however, is to spread awareness of the fact that there is widespread disinformation, denial, and with-holding of vital information pertaining to the attacks; and that the ongoing maintenance of this cover-up appears to be of considerable importance to unknown factions – most likely corporate – within our political/military infrastructure. Our question is, what have they got to hide? We support a new independent investigation into the circumstances surrounding that tragic day. We hope, after having visited our site – and others – and having made an informed foray into the issues currently debated by millions world-wide (including hundreds of people far more qualified than ourselves to speak on these matters), that you will do the same. 1. The 9/11 truth movement is diverse, democratic, and non-partisan. This is not a far right-wing or far left-wing movement. There are Jews, Christians, Muslims, Hispanics, Whites, African Americans, rich, poor, PhD professors, college students, truck drivers, teachers, lawyers, doctors, architects, Reverends,atheists, democrats, republicans, and independents. There is no “type” of truther, because the truth knows neither religious, ethnic, social nor ideological boundaries. 2. The 9/11 Truth movement is not a conspiracy movement. Believe it or not, the majority of people involved in criticism of the government’s official story (the ‘official conspiracy theory’ as many have come to call it) do not know what really happened on 9/11, and they admit that. However, in admitting this they demand that we all should and moreover must know the truth about what did happen. Most agree that whatever the government’s story, it does not hold up to charges of at the very least, omission and distortion if not outright lying. The majority of people involved in the 9/11 Truth movement have far more questions than theories, and almost everyone will acknowledge that no conclusions are possible until a thorough, transparent, citizen-led investigation occurs without the obstructionist tactics and top-secret classifications that our government has become all too good at deploying. 3. The people in this movement are not beyond critical thinking; they are deeply indebted to it. The forums on 9/11 truth have been filled with discussion and debate, much evidence, and many questions. In the past years and months many bad ideas and false leads have been weeded through. We have also become much more clear about what questions remain and what evidence best supports the notion that the government’s story is incomplete, self-contradictory, and often times, simply false. This process of reaching consensus has been dynamic, and it is ongoing. It has been aided rather than hindered by the attempts of many scientists and even self-appointed ‘debunkers’ who have often presented compelling information which was acknowledged, digested, and incorporated into an ever-growing and changing body of knowledge. 4. The people in this movement believe that knowing the truth about 9/11 is essential to the health and future of our country not tangential to it. Whether or not some in the movement hold that there is a secret group of government mafioso, most agree that the bloodshed of the 21st century has been inaugurated on the back of 9/11 and for that reason is in no way beyond our sincere, patriotic doubt and dissent. 5. The people in this movement hold that it is possible for both a) George W. Bush to be close-minded, parochial, and incompetent and b) for people within the government, besides, or in addition to Bush to have sufficient resources and technological know-how to conduct a major covert operation. Lastly, however, they hold that to suggest that our government ‘could not have done this’ (invoking allegations of an inside job) is to forget that ‘to do something’ and ‘to get away with it’ are entirely different beasts. While some believe our government was either inadvertently or directly involved the attacks of 9/11, most believe that the massive cover-up surrounding these events was far from successful, as evidenced by the hundreds of thousands of people questioning the sanctity of that very story. 6. The people in this movement promote the understanding that State-sponsored or condoned acts of terrorism, even conducted against a country’s own citizens, are not only plausible but have likely happened repeatedly throughout our history. Events such as the Reichstag Fire in Weimar Germany, the sinking of the Maine and the Lusitania, Pearl Harbor, and the Gulf of Tonkin incident were all conspicuous national tragedies which became platforms for launching major military campaigns. Whether one takes a strong view of these events and believes they were staged; a middle view of these events and believes they were allowed; or a weak view of these events and believes they were merely taken advantage of–there is no doubt that the history of the 20th century was marked by many moments in which national catastrophes turned into national battlecries. It is more than fair, in an attempt to prevent the 21st century from befalling the same fate, to ask if these have been merely coincidences followed by patriotic fervor or something far more sinister. 7. The people in this movement acknowledge that much of the evidence gathered through their 9/11 truth research is circumstantial and speculative, but that this is reason indeed to continue searching rather than to stop asking questions. A list of such evidence and contradictions therein is quite long: the War Games on 9/11, put options placed on United and American Airlines, Larry Silverstein’s asbestos problem, ISI funding, extremely close interactions between FBI officials and named hijackers, the apparent confusion of identities surrounding hijackers who are still alive, Bin Laden’s dual denial and confession, the loss (destruction) of thousands of files relating to SEC investigations in WTC7’s destruction, the rapid destruction of evidence from the WTC crime scene, the baffling inepitude of our national air defenses, the pools of molten metal found beneath the rubble, and the general improbability of the WTC collapses…all of these and many more are grounds for serious concern. People in this movement wonder if the offense taken by others when reacting to suggestions that the Government’s story simply cannot take these anomalies into account is a sign that they are suffering from willful ignorance, denial, or worse. 8. The people in this movement acknowledge that while the burden of proof is on those asking questions, the burden of truth is on every citizen, American, and human not only in this country but on this planet. They acknowledge that neither the government nor the media can be relied on to find that truth. And they proclaim that it is the duty of every citizen to support — not the officials of their government or even their own country’s army — but the values that both their institutions and their military were created to protect. They acknowledge that the lives lost on 9/11, the lives lost defending freedom and real democracy throughout history, and the lives that will no doubt be lost while following the orders of a corrupt administration in the future, all deserve nothing less than that truth. 9. Lastly, they believe that truth — in due time — cannot be suppressed and that justice — in due course — cannot be contained. 1. So what is the ‘truth’ then? We are not privvy to enough information – much of it withheld by the US government – to speculate or theorise about what happened. We do not know the truth. We do know, however, that there is sufficient evidence to suggest a cover-up of the truth, owing to the copious and glaring inconsistencies in the official story. We are campaigning that the truth be known through a new and independent investigation. 2. But they wouldn’t kill their own people, would they? Operation Northwoods. In the 1960’s the US Government planned to justify an attack on Cuba by staging terrorist events in their own country, killing US citizens. This is a brief interview with the man who discovered the now unclassified CIA document. The video shown in question 3, “But they’d never keep it a secret!“, is also related. 3. Look how incompentent the US is in Iraq! How could they manage such a complex operation as 9/11? If factions within the US government are incapable of pulling it off when it has access to possibly the world’s largest military and secret service, how could a group of Saudi terrorists with a leader living in a cave in Afghanistan suffering from renal failure (and reportedly on and off a dialysis machine: he was admitted to hospital in Pakistan with this condition before Sept. 11th, 2001) carry it off? Watch this Whitehouse spokesperson walk-out on reporters questions concerning Bin Ladens ability to travel around remote terrain, evading UK SAS and US Delta special forces, when he is reportedly on dialysis and dying of kidney failure. There are even reports that Bin Laden is dead. If he did die, when did he die? Some sources, including Pakistani President Pervez Musharraf, maintain he died as early as Dec 2001 (reported in New York Times, July 11, 2002). Why won’t US intelligence admit this? 4. But they’d never keep it a secret. Somebody would speak out. Did you ever hear about the USS Liberty? This “false flag” operation (meaning an orchestrated attack on one’s own public and/or forces which is then blamed on the enemy) happened in 1967. The CIA documents have even been de-classified: i.e, it is openly admitted. The video shown in question one, “But they wouldn’t kill their own people, would they?“, is also related. Or Operation Gladio? Or have you ever heard of any black operations? Why do you think that might be? Should we dismiss the idea it is possible to keep these things covered up? Or would it be naive for us to believe that there are not people willing to do such work for the right money and with the right motivation (many secret military and spy operations have been carried out throughout history where the participants – and even their families – have been under threat of death). You can email us at oxford911truth (at) gmail (dot) com. Contact us at oxford911truth (at) gmail.com with MEDIA in the subject line. 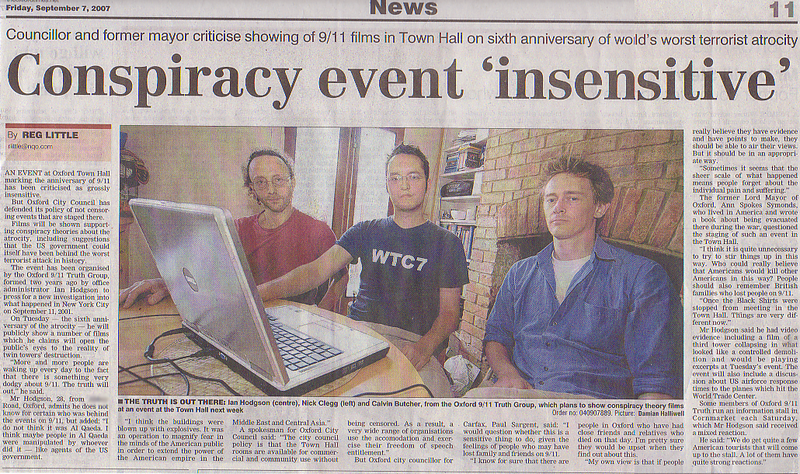 Click on the image (left) to read the 7th Sept Oxford Times article written about us prior to our 9/11/07 event.